Tagged under Puella Magi Madoka Magica, Golden Eyes, Curls, Blonde Hair, Waifu. 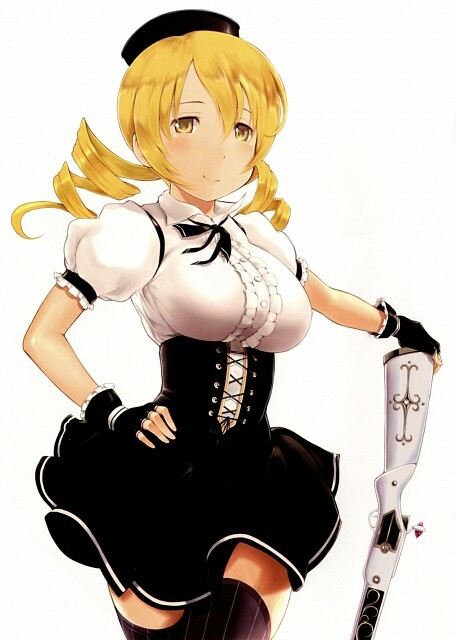 Mami is a veteran magical girl whose territory is Mitakihara, the city Madoka and the other girls live in. She rescues Madoka and Sayaka when they're caught in a witch's labyrinth while Madoka was rescuing Kyubey. After healing Kyubey's injuries, Mami takes it upon herself to prepare the two girls for their life as magical girls, explaining their tasks and what the contract with Kyubey entails. Mami is elegant and poised, but can harbor a quietly threatening air when need be, especially towards Homura Akemi. She lives alone and is in her third year of middle school. In the third movie, Mami is accompanied by Bebe.